We designed private and public spaces for the new residential area built within the confines of the IBA (International Building Exhibition) in 2013. 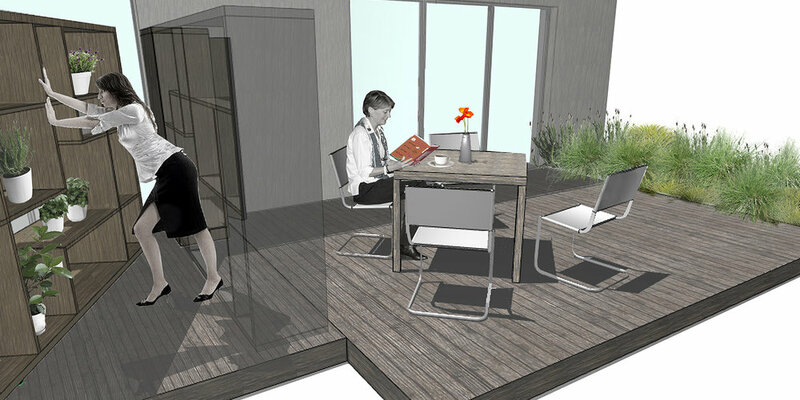 In this garden redesign project, we aimed to create a harmonious yet multifaceted space for our private client. 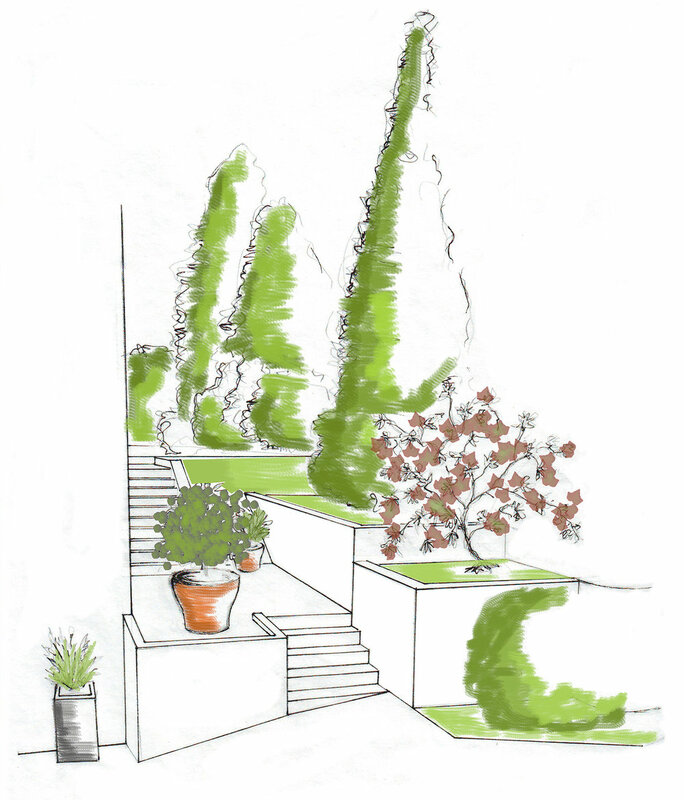 The concept of our design divides the garden into three settings: the terrace in front of the building, the height-bridging middle section with vegetation cassettes and the lower lawn level. There is an elegant yet secluded "whiskey place" with a seating set against the stairs. 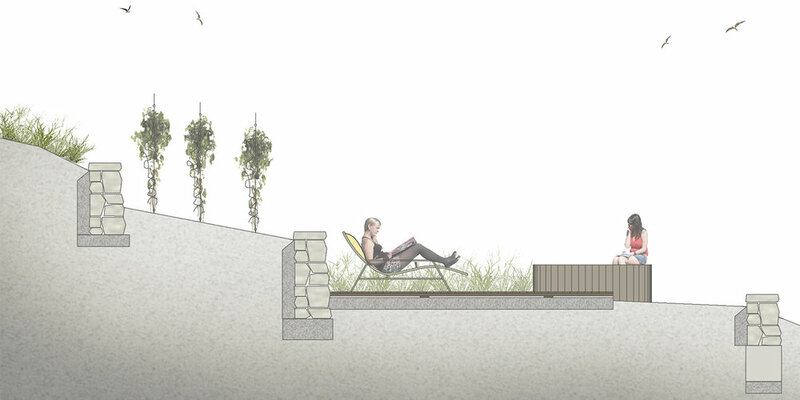 A modern sculpture-seating combination with a 70 cm high water play is located on the side of the whiskey place to create an enclosure to the rest of the garden. Another water play brings completeness ad tranquility to this patio from the side of the staircase - the 1 m wide strip of water creates a 1,7 m tall continuous flow with a special microclimate in summer's high temperatures. It is drained from a metal tray to the pebble bottom pool. The verdure is carefully selected of decorative, perennial and ornamental shrubs to match the style of the building. Shrubs and groundcover decorates the shaded spaces under the existing trees. Lead designer: Select Art Kft. Within the hills of Budapest, elevation is always a predominant feature – height differences had great influence on the garden's image. 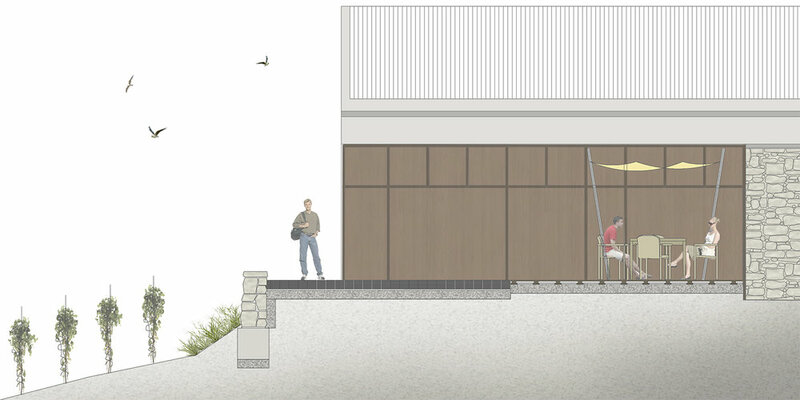 A chain of retaining walls soften the steep slope as we approach the building - their stone-clad concrete structures aim to highlight the character of the residence, while in the far-off parts of the garden they appear as dry-walls or vegetated retaining walls. The flattened intermittent spaces become lawn surfaces where the garden pool and garden pond are placed, accompanied by a small water feature that boosts the cooling effect of water. Connected to the upper terrace of the house, we created the furnace and a space for secluded relaxation, delimited from the neighboring plot by a pergola. The site, characterized by its sloping, rocky surface was divided into three garden units: a lower vineyard, a resting and dining area separated by a backrest in the middle, and an upper orchard including the playground, that gradually disperses into the nearby woodland. The strong yet simple outlines of the design were determined by traditional vineyard structures, in terms of materials and native plant use the garden adopted the unique characteristics of the peninsula. Lead designer: Dóm Építészműterem Kft. Pöttyös (meaning ‘dotted’) Square is located in the center of Esztergom, a cozy, secluded community space along the axis of the Fő square and the Basilica. The surrounding buildings shield the square from the noise and air pollution of the adjacent streets. It invites the passer-by for a quiet, recreational stay. The aim was to give a quality spatial definition to Pöttyös Square, both in terms of aesthetics and usability. This increases the attractiveness and cultural potential of the square, indirectly affects the quality of life of inhabitants of the surrounding residential buildings and of distant ones alike. 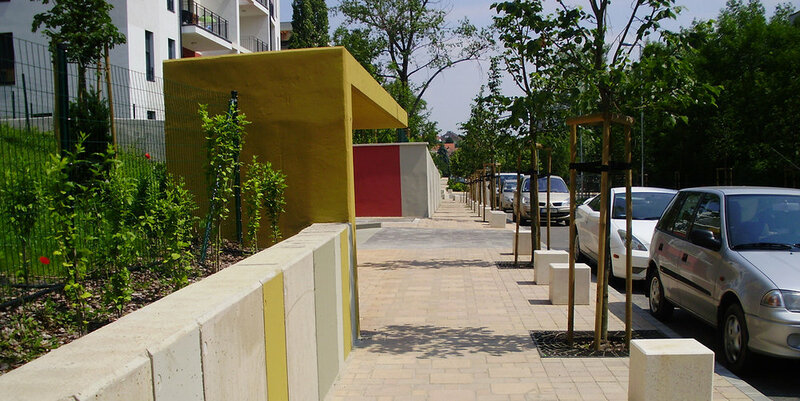 The central area can be divided into three main functional units: a multi-generation residential space in front of the eastern residential building with a playground, outdoor tables and seats; a recreational area incorporating circular perennial and annual beds in the middle area in reference to the name of the square; the third segment is defined by a transparent, multifunctional paved surface that can be used for cultural events and gatherings. A solid aspect of the design concept was to make the entrance areas of the neighboring residential areas more visually present in space, to transform the fragmented space structure into adjoined, complex units. The monument of the Arad martyrs was allocated to the axis between the eastern and the southern entrances, thus giving an elevated atmosphere around the sculpture. Our main design intent was to create spatial foundations for social, economic, and environmental growth in Oroszlány. The reconstruction of built and natural elements in the heart of the town also increases life quality in its immediate surroundings, and therefore attracts high quality services that take this growth even further towards functional diversification. 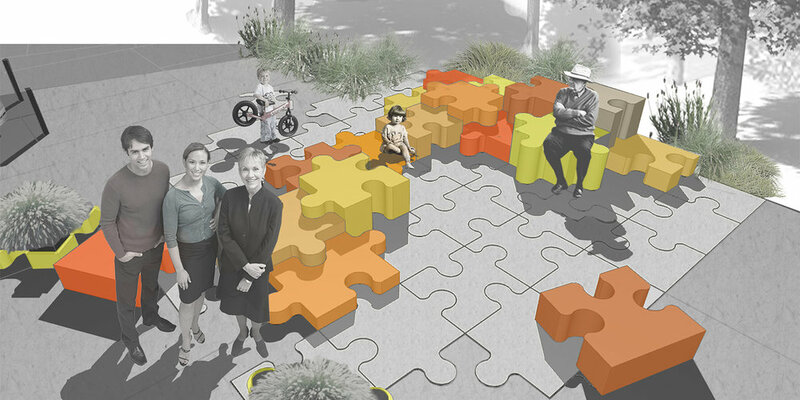 We envisaged individual square-segments where vibrant cultural life can take over and socially enrich open space. We avoided enforcing specific uses on these public areas, and aimed to provide a transformable setting for various recreational and cultural activities. Unfolding urban space through the visual experiences gained through movement, the viewer becomes part and even transformer of her/his own urban living space. The use of new public space also has a positive influence on the revitalization of the aging population, thereby reducing urban migration and making the town attractive to young families and children.